This dictionary of terms is aimed at a broad audience. It wants to provide a fast access to the wide field of African oral cultures. Primarily the book wants to help students who work in the field of African orality, but it is also useful for anyone not specialized in this field of study but interested in getting a first impression of it by means of short articles / miscellanea. Within the last two decades there has been a continuously rising interest in comparative, socioanthropological and literary-esthetic analysis of texts in African languages. The cultures of Africa are rapidly changing and in a transition from orality to recorded writing. Anyone who is interested in Africa’s spiritual and social institutions and in Africans’ mentality and way of life, their poetry and music, has to refer to orally transmitted sources which have been set down in writing. Oral Literature in Africa by Ruth Finnegan, published back in 1970, is the only methodologically related work which sums up the different methods of research in oral literature. Every keyword has its English and French equivalent given in an English and a French subject index at the end of the volume. An extensive and detailed bibliography gives all sources that are quoted in the articles. Es war in der Tat höchste Zeit, das verstreute und äußerst heterogene Wissen zur Oralliteratur in Afrika bzw. zur afrikanistischen Erzählforschung zumindest ansatzweise zu bündeln. [...] Kurz und bündig gehaltene Stichworte, viele Querverweise, ein englisch-deutscher sowie ein französisch-deutscher Index und schließlich zahlreiche weiterführende Literaturhinweise ermöglichen einen guten Einblick in die komplexe Thematik. [...] An der Ausgestaltung des einen oder anderen Stichworts gebe es, je nach individuellen Vorlieben, sicherlich auch noch etwas herumzukritteln. Insgesamt jedoch ist den Herausgebern und ihren Mitautoren ein empfehlenswertes Nachschlagewerk gelungen, dem weite Verbreitung zu wünschen ist. Les littératures orales africaines constituent un domaine de recherche immense, mais dont la documentation se présente de façon éclatée. Tout outil qui permet une approche et une première orientation dans ce vaste domaine, et au-delà, qui favorise des recherches approfondies et spécialisées, est exctremement utile. 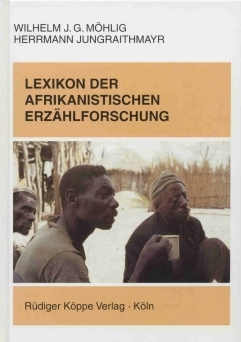 Le Lexikon der afrikanistischen Erzählforschung (Dictionaire de narratologie africaniste) édité par W.J.G. Möhlig et H. Jungraithmayr répond à ce besoin.